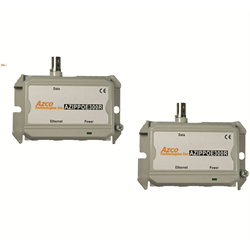 The Azco IPPOE300 balun pair sends 10/100 Mbps IP over RG59 or RG6 coax cable. 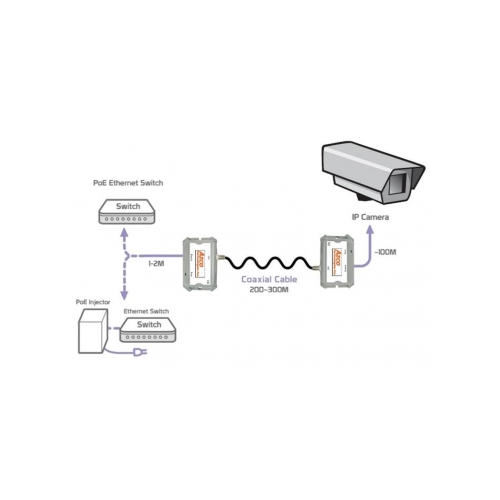 It can also send PoE power if the source Ethernet connection includes PoE power or has a PoE injector. Uses this balun pair to connect IP devices like security cameras over existing coax cable. Coax cable run may be up to 600-1000 feet depenending on the type and quality of the coax cable. The receiver balun can be connected to the IP device up to 100m. Fully compatible with IEEE 802.3af standard, with a speed of 10/100 Mbps with full duplex.